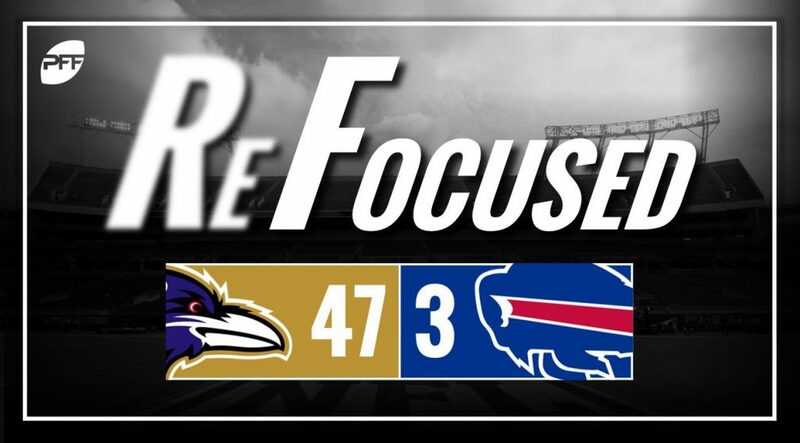 The Baltimore Ravens defeated the Buffalo Bills, 47-3, during the NFL’s first full Sunday of action. This game was decided extremely early, as Baltimore’s offense deployed various trick looks and packages with and without rookie Lamar Jackson. Quarterback Joe Flacco was efficient, and he was given nearly all day to find open receivers, as he picked apart a Bills defense that graded as one of the best in the NFL a year ago. This was an impressive performance regardless of what happened on the other side of the ball. Ravens fans got their first real look at rookie Jackson, and there was a little flash, as he forced a few missed tackles with his legs but was spotty with his accuracy. With the game completely out of reach the entire second half, the Ravens called almost all runs while he subbed in for Flacco and didn’t get many opportunities as a passer. While the Buffalo offense didn’t do itself any favors, it shouldn’t take away from the excellent work from Ravens’ secondary. The combination of cornerbacks Brandon Carr and Marlon Humphrey registered four pass deflections and one interception, and Carr forced Bills wideout Kelvin Benjamin to deflect another target from his waiting hands on a vertical route early in the second quarter. The final ingredient for Baltimore to dictate the flow throughout the game was provided by its fierce pass rush. The Ravens put up seven sacks, a batted pass and held the Buffalo offense to only 2.5 yards per play. Defensive back Tavon Young initiated the onslaught on the Bills’ opening drive, scoring his first of two sacks on the day by bringing down a scrambling Peterman on third down. Rookie first-round pick Tremaine Edwards looked very much like a rookie against Baltimore, as he seemingly looked lost in coverage on a number of plays and missed a handful of tackles. He flashed the speed and athleticism at times, getting into the backfield on runs and breaking up a pass over the middle, but he’ll need to become much more consistent in all facets. Last year’s rookie sensation, cornerback Tre’Davious White, wasn’t tested much, as Flacco avoided throwing his way most of the game. Outside of White, the rest of the secondary that performed extremely well a season ago struggled to keep up with the misdirection, tricks and gadgets the Ravens’ offense threw at them. A shutdown corner does a lot, but he can’t cover everything up. After replacing Nathan Peterman under center, the Bills’ 2018 first-round selection out of Wyoming, Josh Allen, instantly added a spark to an otherwise lifeless offense. On his second series, Allen connected with wide receiver Andre Holmes on an in route within the coverage of Ravens’ Carr. The hookup gave Buffalo its first passing first down of the game with 6:37 left in the third quarter. In addition, Allen showcased his mobility during the lone scoring drive for the Bills with three scrambles totaling 28 yards. The Buffalo passing offense struggled to get anything positive on the board, and the ground game suffered from the effects. Starting running back LeSean McCoy collected 12 of his 22 rushing yards on one run and averaged 1.5 yards/attempt on his other six carries. He also had three rushing attempts wiped on holding penalties. Flacco sliced and diced up a Bills defense that suddenly looks slow up front and lost on the back end. If drafting a quarterback in the first round was what Flacco needed to light a fire under him, what took Baltimore so long to do so? It’s one game, but the Ravens look primed for a playoff run. The Bills’ offense sputtered – to put it mildly – across the board with Peterman under center. Peterman led the offense on 10 drives and had just one first down, five first-half penalties, two interceptions and six punts to show for the effort. Allen did show promise with his live arm and plus mobility, but this team is currently behind the curve for success during the 2018 season.